Guess what Friday means? It means a new Bake Shop Blanket Square! This week’s square is one that really reminds me of my grandma and her cozy 1950s house always smelling like something delicious. She would have totally made a pie like this one. And I can feel her smiling down on me as I write up this little crochet pattern. It a Cherry Pie Granny Square! Don’t let that lattice crust intimidate you… it’s a lot easier than it looks. I promise. And so much quicker than baking a real pie with a real lattice crust. You don’t have to stand all day in the kitchen for this little guy. Although if you did make a real pie, can I have a piece? Now I’m hungry – dangit! Me and my hunger aside, here is the handy pattern! Oh – and don’t miss the video tutorial! *Note: I crochet this portion VERY loosely! Voila – a cherry pie! Hope you guys enjoyed this little bake shop beauty. Be sure to watch out next Friday for the next square in the series!Thanks for checking out this installment of the Bake Shop Blanket Series! Click HERE to see the whole project finished and get all the other squares! 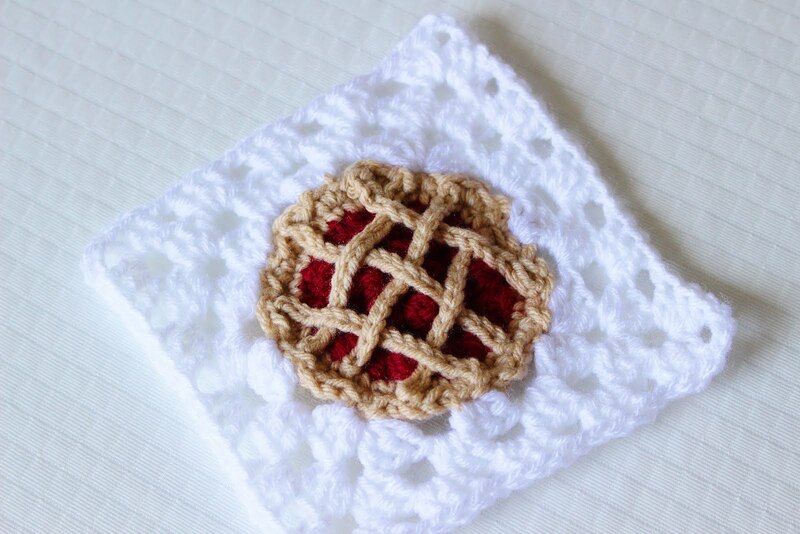 I just crocheted up until the outer crust, the pie isn’t looking quite proportionate. I’m not sure if I did my berries too tight or my hook size. For my afghan I’m using a “J” hook. So I guess my is, do I use a “J+I” hook, or “J+H” ? I’ve gotten some feedback on this problem, I crocheted the berries super loose so that they would lie flat. It may help to go up a couple of hook sizes! I also added a different sweets to my pattern. By any chance wold you know how to do a gingerbread man inside a granny square? I ended up sewing my 1st one on top of the square because I was unable to find any sites or tutorials on how to do so. Oooh I haven’t done a gingerbread granny! How many stitches should I have on the final row of pie crust? The granny square is not linine up for me.